AMC's Great Kids, Great Outdoors: Q&A: Can Outdoor Nation's Young Leaders Get More Americans Outside? Q&A: Can Outdoor Nation's Young Leaders Get More Americans Outside? About 100 young people camped out on Georges Island, one of Boston’s Harbor Islands, last weekend. Their purpose was bigger than just a fun night under the stars; these campers were part of Outdoor Nation, a three-year-old national group that works to increase youth participation in the outdoors. The Boston “signature summit,” which drew a total of 140 participants and followed similar gatherings in Los Angeles and Austin earlier this summer, consisted of two days of brainstorming sessions and project planning meetings, as well as some time kicking back in tents. Kelly Greenwood, a summer intern at AMC Outdoors and AMC Books, was there. I asked her about what she learned. Who attended the summit and why? Teenagers and young adults ages 16-26. Along with 20 AMC staff and interns, groups from the Student Conservation Association, Virginia State Parks, Leave No Trace, high schools, and other youth groups across the East Coast were represented. Although most participants came with a group or organization, many individuals showed up on their own. The group leader of the project that won the most grant money was a guy who had never heard of Outdoor Nation until the day of the event. He had been walking by, which sparked an interest in what we were doing; he joined in and won $2,500 toward seeing his project become a reality. Everyone there shared one common goal: to identify the problems keeping Americans from enjoying the outdoors, and to come up with solutions. Each group presented a project they had thought up and developed over the weekend that they believed would help get their communities more involved in outdoor activities, and the top 10 projects were awarded seed grants to get their ideas rolling. The summit was part conference and part camping trip. The conference aspects were still relatively informal, with discussions and “think-tanks” dominating the time, intermixed with fun quizzes and speeches. It was a very high-energy event, and although we were working hard from breakfast to dinner, it was still a relaxed environment where we could share ideas and discuss issues. As for the camping, it felt like your typical weekend camping trip, plus 100 extra people. There were tents, a campfire, and even ghost stories, allowing everyone to get to know each other and build relationships. Thankfully there were no interactions with the Lady in Black, the ghost of Georges Island. What did you learn from the weekend? What surprised you the most? It was eye-opening to realize just how removed many of the participants feel from nature. While I have grown up lucky enough to be close to wilderness, most of the participants were from urban environments or were minorities, and 80 percent of minority youth do not participate in outdoor recreation, according to one speaker at the event. It shocked me to learn how many young people do not even have access to safe and clean neighborhood parks, let alone forests. One goal of the summit was to vote on the best ideas for projects that Outdoor Nation could fund to get Americans outdoors. What were some of the most interesting ideas you heard? How did the voting work? The most interesting idea I heard was called Spreading Roots. This project plans to have college students mentor high school students, who in turn will mentor middle school students, getting an entire community involved not just in outdoor recreation but leadership. It allows for a student to stay with the program for many years, but to still advance. The voting was done electronically with a keypad that each participant was given at the beginning of the summit. The voting was broken down into five categories, ranging from “how likely is this project to succeed” to “how effective is the project in meeting the goals of Outdoor Nation.” We rated the 17 projects in each category on a scale from 1-10, and the eight projects with the highest overall ratings won (it turned out to be 10 projects because of a tie). The first place project won $2,500, the second place project won $1,500, and the next five won $1,000 each. This year, there was a three-way tie for eighth place, so Outdoor Nation gave each of those projects $750. AMC members split into three groups and came up with three distinct projects, two of which won $1,000 grants. One of the winning projects was College Outdoor Mixer, which proposed a race through the parks in Boston for college students. The race, which will also be part scavenger hunt, will introduce college students in Boston (a huge number!) to the parks available to them. I was part of a group of eight Boston staff and interns that proposed a project called Boston Is Outdoors, which also won $1,000. Our project is an 8-week series of walks through Boston’s green spaces, led by two young staff members. The idea is that anyone can participate, although the target network is young professionals looking to build a network of outdoor-oriented peers. One week will also feature a more challenging option, like kayaking the Charles, all for free. Where does the money for Outdoor Nation come from? The Conservation Fund, The North Face, and REI Foundation are the three biggest partners of Outdoor Nation, but they have many other partners who offer support. AMC was a partner for the Boston event. What’s your favorite idea for getting more young people actively involved in the outdoors? The project that earned the highest rating, Get Out and Stay Out, will pair five mentors with five high school students to teach them outdoor skills, recreation, and leadership. Instead of just taking kids outside, this program will teach them how to enjoy the outdoors on their own, and to lead others in the same manner. I liked this idea in particular because it is built on the belief that everyone should be able to have the opportunity to get outside, no matter what their background, experience, or age. I also really liked the Deals for Wheels project, which plans to partner with local businesses to get discounts for customers who use active transportation, like bicycles. The project will not only promote getting active and reducing our transportation impact, but foster community relations and support of small local business. For such a simple concept, it has a huge impact. Do you think the projects will succeed? Given how determined many of the groups were to see their projects become a reality, I believe many will succeed. Outdoor Nation offers them support that goes beyond grant money, to help them get their projects off the ground after the Summit. 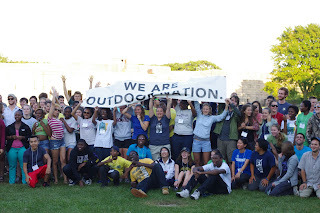 The network created by Outdoor Nation also connects young people, foundations, and businesses with the same goals. In addition to gatherings like that in Boston this summer, Outdoor Nation offers intensive leadership training summits and will convene an invitation-only “National Congress” in Washington, DC, in late August. 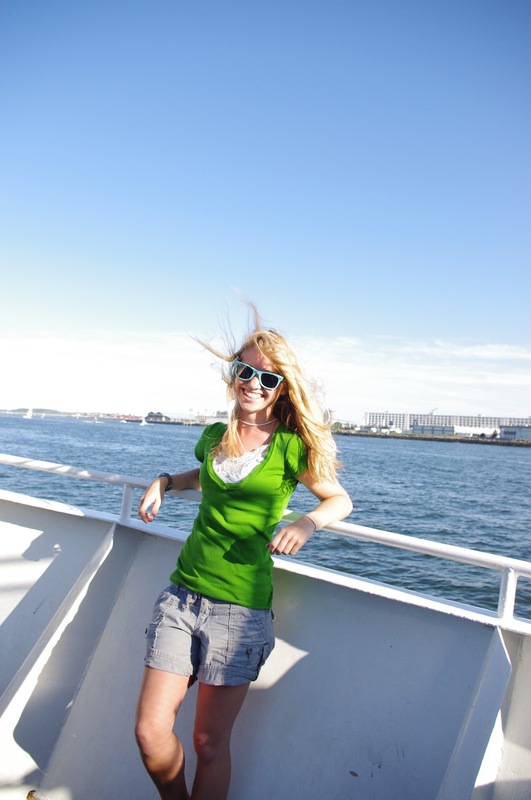 Photos, which show Kelly Greenwood on the Boston Harbor Island ferry and part of the Outdoor Nation group, by Cormac Griffin.